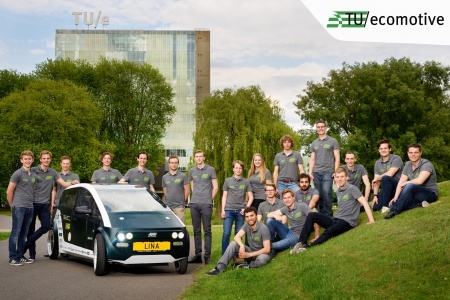 On May the 17th students of the Eindhoven University of Technology (TU Ecomotive) officialy unveiled their fourth concept car: Lina. World’s first car made from bio composites. Unique to Lina is that her entire chassis, body and interior are made from bio-based materials. Thanks to a weight of just 310 kilograms, the car is extremely efficient. The city car seats four people. TU/ecomotive utilizes a combination of bio-based composites and bio-based plastics to create their chassis. The bio-based composite is made from flax, a plant that can be grown in the any moderate climate. The bio-composite has a strength/weight ratio similar to glass fibre, but is manufactured in a sustainable manner. A honeycomb shaped core produced from bio-plastic, known as PLA and made entirely from sugar beets, is placed in-between two flax composite sheets to provide stiffness to the strong composite. The drivetrain of EM-04: Lina is electric. Power is supplied by modular battery packs, giving a power output of 8kW using 2 DC-motors. This allows Lina to reach a top speed of 80 km/h. Lina is the next step to the car of the future. Sustainable materials, efficient drivetrain and still practical due to its four seats and small dimensions.